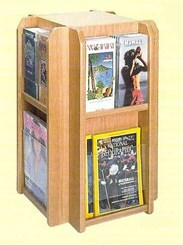 Turns at the touch of a finger to display magazines, catalogs and brochures in only two square feet of floor space. Clear acrylic panels keep literature in place but fully visible. Racks are solid oak with matching laminate backing. Matching oak laminate pedestal. 16-1/2"W x 16-1/2"D x 61-1/2"H. Shpg. wt. 55 lbs. PRICE INCLUDES FREIGHT! Please allow 1-2 weeks for delivery. Same as above except with eight pockets. Does not include pedestal. 16-1/2"W x 16-1/2"D x 24-5/8"H. Shpg. wt. 34 lbs. PRICE INCLUDES FREIGHT!